Prove All Things; Hold Fast That Which Is Good.-Paul. 1/1, April 14, 1860-1/7, June 2, 1860. $2.00 a year. This was the short-lived reappearance of The Spiritual Age. The journal contained considerable comment, pro and con, on T.L. Harris's new Herald of Light and its (supposed) abandonment of spiritualism, and also articles on conditional immortality (whether souls are necessarily immortal) and interesting advertisements. 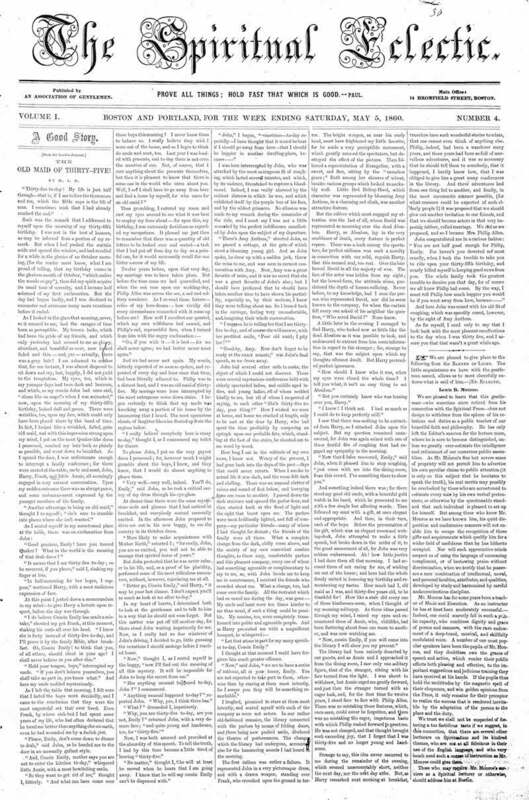 The journal never developed a vision of its purpose and ceased after seven issues. Harvard University microfilm.